Today's Letters: Dear Mr. Loerke, before we met I had never eaten Oreos in a fort, worn boy skivvies to bed, or read Emergency Medicine books about abscesses. Reason #270 why boy roommates are the shiz. 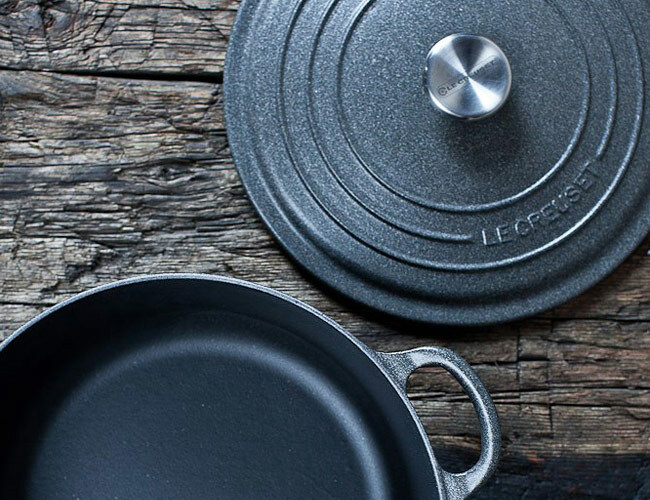 Dear Le Creuset, I've always liked your vibrant colors, but your new murdered out Garden & Gun inspired French Ovens are completely swoon worthy. Dear Papa, recently you told me about your plans to grow moon & stars watermelon in your garden. Love you more than spitting seeds off the dock at Beaver Lake. Dear Husband, your new10a-10p shift means I'll be eating lots of cereal for dinner. Thanks for making sure we had an extra gallon of Bessie in the fridge. Favorite Milk? Team Loerke = Promised Land 2%. Final answer. PS, some of you asked about the book Tim mentioned yesterday in his letters. It's called "Sacred Influence" by Gary Thomas. It's written for women and has quickly become one of my favorite marriage books I've ever read. Be sure and check it out! I'm not really picky about the brand as long as it is organic soy milk. Now cow milk for me! Well it's Semi-Skimmed and comes in a bottle with a green top then again it sometimes varies where you buy it from because I'm pretty sure it still comes with silver and red metal tops with the Milkman. I had cereal for lunch on Monday then again I was off work poorly and couldn't be bothered with any cooking. Silk light soy milk for me, please! I just found your blog! I love all of your advice :) Are you a Christian? I just stumbled across this site, and I love it! Your letters are so cute. Wearing boys skivvies are the best, as are forts. And for milk, I Eberhard's (comes from the next town over from me) whole milk. Whole milk helps you absorb more of the calcium then lower fat percentages. But I also really love almond milk and coconut milk. Horizon Organic Skim Milk for me please. As a kid I drank 2% and nowadays I have no earthly idea how I drank it. Way tooo thick. Now it's good for cereal and dunking the occasional oreo cookie. About to read "Sacred Influence" with some other women! Can't wait :) Glad to hear it's awesome.